Commercially manufactured butcher block was introduced in the 1880s as a sanitary alternative to the traditional use of blocks cut from trees on which to cut meats. Hard maple became a favored surface for its durability and tight wood grains. Modern butcher block is durable and safe for food preparation and is available in sizes from small cutting boards to full-kitchen counter tops. Counter tops can be made from the same butcher block as a cutting board. Cleanse butcher block counter tops thoroughly with dish-washing soap and water after each use. Wood absorbs food odors, oils and bacteria from raw meat making it imperative to properly clean. Mix a mild solution of 1 tbsp. bleach into 1 gallon of warm water. Wash the counter top with a clean sponge, rinse, then wipe dry to further cleanse bacteria. Wipe stains from a butcher block counter top with lemon juice. Rinse and wipe dry. Shake salt onto stubborn stains and then rub with the cut edge of half a lemon. Let the salt and lemon sit overnight on the counter top and rinse with water and dry. For tougher stains, try 3-percent hydrogen peroxide mixed with water. Rinse thoroughly and wipe dry. 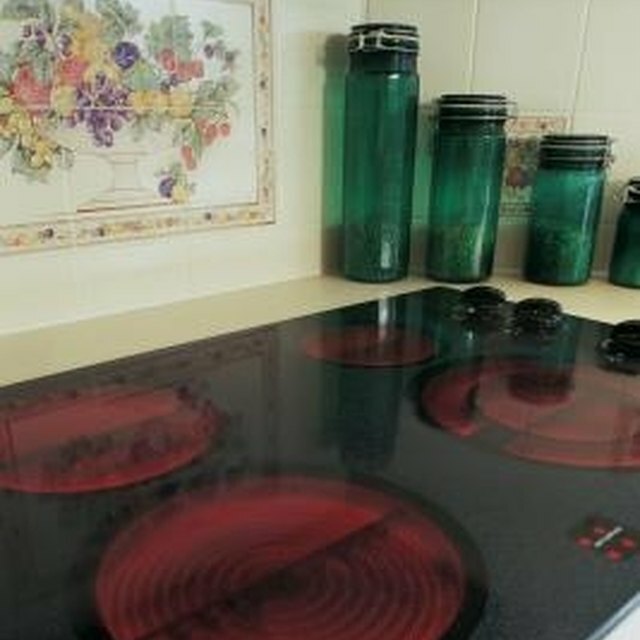 Scrape the counter top each evening with a metal spatula or scraper to remove lingering odors or stains. About every two weeks, apply mineral oil or a food preparation surface commercial product. This helps seal the wood and repels stains. Do not use olive or vegetable oils that will turn rancid. Never allow raw fish, poultry or meat to sit on the counter top for any length of time as the juices will be absorbed into the wood, creating a bacteria-ridden surface.